Now you got an idea of how to access the values in client-side. 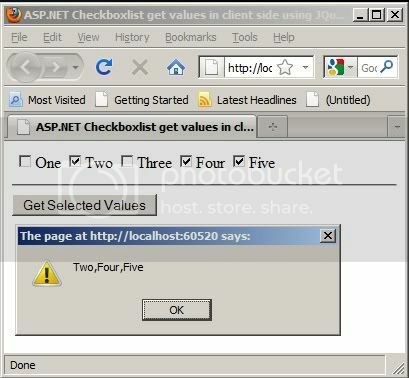 Hope it will help you to findout the selected items of checkbox list using jquery. very good rich article. I tried and worked fine. thanks. how to populate gridview on the checklistbox items selection? how to filter the gridview with all the selected checklistbox items? Its awesome.... Thanks for this..
how to get values instead of text?